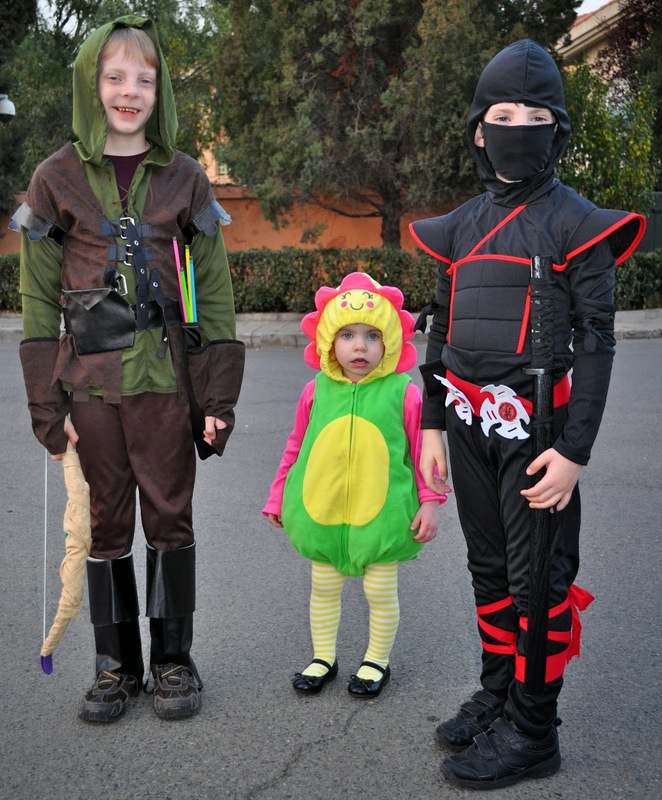 We went trick-or-treating (I never know the correct way to spell that) twice, of course. We went to two Halloween parties (because one is never enough). We collected our weight in candy, most of which Claire can't eat and Caleb won't eat -- doesn't like chocolate so much. Yeah, we're all a little confused. But, Isaac is delighted because he eats everything. Even the interesting stuff we got from the Japanese houses we visited. Gummy corn anyone? I say thanks anyway, Isaac says he'll give it a whirl. Claire insisted on walking the entire route (both times) and carrying her own bag. It was a long couple of nights. Everyone let her take her own candy -- because she was so cute -- and very quickly she perfected grabbing it by the handful. She didn't even want the candy, she just wanted to be like the big kids. The boys went to a Haunted House and weren't scared at all, or so they told me. And we were accosted more than once by teenage boys in scream masks. Claire was not amused, and neither, frankly, was I. We lost Isaac for a little while. Turns out he wasn't lost at all, just decided to hang with another family without telling us. Sometimes he's awesome. All of the kids had experiences with nearly being trampled as the high school contingent sprinted in herds from house to house desperate for another starburst or gummy octopus. I don't remember going trick-or-treating when I was in High School...did we? And, we came home with piles and piles of the strangest Halloween haul I've ever seen. 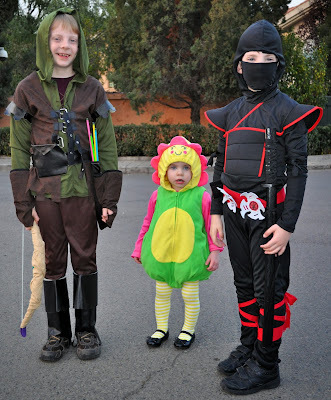 Robin Hood, a flower (sort of deconstructed), and a black ninja. But, most importantly, we were together and we had a fabulous time. And, we're already planning our costumes for next year! Halloween in Beijing is INSANE but lots of fun! We lost our 3 year old as well for a while do to drifting with other groups of kids and families he knew and the haunted house is still one of legend for my daughter. Glad you had a fun outing. Everyone should experience at least one super wild trick-or-treat-arama in their lives. As far as the high school groups - we made them do a trick for their treat with the caveat that if it was boring or a joke we heard before they would owe us a piece of candy. Best result: an impromptu river dance line of about 15 to 20 kids. They were actually pretty good and had a blast doing it. That is one of my favorite memories from those days.